Today, I’m going to show you how to fix an odometer that doesn’t work. So I just got the jeep-string running, I got it registered and now I’m out for a ride. One thing I immediately notice is neither the triple odometer nor the regulator odometer is working, they are not spinning at all. Since this car is new to me, I’m not completely sure whether if it has 120,000 miles or more. But one thing is for sure, I want to fix the odometer so that it works. Now, this fix I’m just about to show you apply to pretty much any car with analog dash with this numbers that actually physically spin. The digital dashes are a little bit different. Why the Odometer Doesn’t Work? 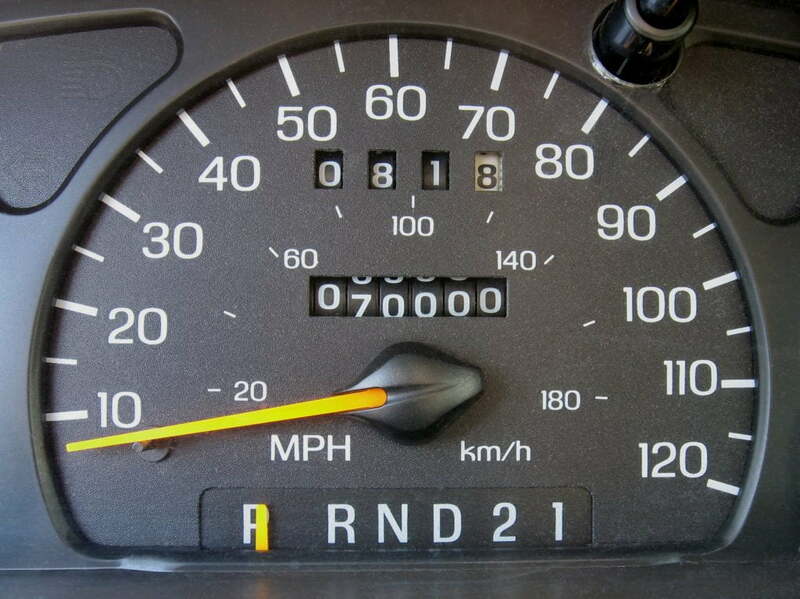 There are two common reasons why odometer stops working. Back in the old days they actually had a spinning cable that was connected to either the wheel or the transmission and that spinning cable would turn the odometer so you get the mileage. I’m sure you have seen in the movies where somebody puts the car up and jack stands or runs the car in reverse to roll back the odometer, well that is something that could happen back in the day. But today’s vehicles are completely different. They use something called a vehicle speed sensor which is this right here. It converts a mechanical signal so this spins to the electrical signal which runs up to the dashboard and then turns out the odometer. This works for digital and analog gauges. So if you put the car on the reverse, it actually increases the mileage on the car not decreases. Like anything else since this is mechanical, and it spins, these speed sensors w3ear out. Usually, when they wear out, you might get the check engine light. But more importantly, your speedometer and odometer won’t work. So if your speedometer and odometer don’t work, you want to replace the vehicles speed sensor. The vehicle speed sensor is located right underneath the vehicle. So if we start from the front of the car, pass the oil pin back to the transmission, if we look on the rear of the transmission, you could find the vehicle speed sensor right back here. It’s easy to replace with just one bolt holding it in. So replacing the vehicle speed sensor is a common fix when both the vehicle speedometer and odometer are not working. But in our case, the speedometer works just fine. It’s just the odometer that’s not working. The reason why the odometer stops working is that there are these gears that actually spin the odometer and these gears get brittle because they are just made of plastic and the teeth break off and THEN there is nothing to actually spin the odometer. So it is to remove the gauge cluster and replace these gears. Although this job seems quite intimidating, it’s really simple to do. All we need is a flat head screwdriver, a T15, a T 20 tocks what has a screwdriver end and then of course you have your new gears. These gears come with a real lifetime warranty; they are really inexpensive and are made of better quality plastic so that hopefully you will not have to do this again. Since we are going behind the dashboard and remove the dashboard. I’m going to replace the old incandescent lights with these new LED dash lights that will probably never burn out. Let’s grab our tools and begin. Every time you are working with electrics in the car such as removing your dashboard, you want to make sure you disconnect the negative terminal on the battery. That way nothing shorts out by mistake. After the negative terminal is removed, we can go and remove our dashboard. Inside the car, there are two bolts that we need to unscrew at the top of the dash. There is one, there is two, just in case you don’t have a stock split that fits this, you can use a 7 mm socket which works as well. Next, grab the headlight button and pull it outwards and then turn it so that you can see the slot in the side of the plastic. Stick your flat head screw driver into that slot and pry into the clip and pull outwards which will remove the switch. Now we are going to remove the plastic bezel that covers the gasses. On the right corner and the right corner are clips. So what you want to do is to get your fingers behind the bezel and with a firm pull, pop the clips that hold that in and the bezel will come right out. With the bezel removed we have 4 screws we need to remove. There is one down here, there is one up there and if we go to the other side there is one down here and one up there. Again use your T 20 or your 7 mm. there is one and two and then we go to the other side there is three and four. With all four bolts out, gently pull the gauge cluster out far enough so that you can disconnect the back with the wiring harnesses. Now that should give us room, to get to the other one, the same thing it has a little clip and you have to press in and pull it right out. Now we can remove the whole gauge cluster. Alright with all our gauges clusters removed, we can put them on the workbench to make it easier to work on. Now all these gold colored screws on the outside have to be removed. You can use a t15 tocks or a 5.5 mm socket. With the last screw removed, now we want to gently remove this cover and place it at the side. If you have any dust between the gauges and this plastic piece, you can get some compressed air and blow the dust-out. I don’t know about you but I hate when there is dust between the clear plastic covering the gauges. Now there are three sections of gauges that we need to pop out to grab a screwdriver and carefully pry upwards. That should come right out; you can see these pins plugged right into there. Next, there is one more gold screw on this side that we have to remove. Good and now pry the gauges on the right side up and now we can remove the middle gauges just like so. With the middle gauge cluster completely removed, we can flip it over and you could see the gear which is located right down here. So what happens is that the speed sensor signal comes in here and it tells the motor how fast to spin. That motor has a worm gear on it which is this right here. That warm gear spins the striven gear, the black striven gear right there which spins the red gear which gives us our mileage. Next, we want to remove this motor right here. Grab your flat head screwdriver, you can see this little plastic clip right here and the blue. You just want to pop that out at it and twist your motor and that will get your motor and that will allow the motor to come out. Now to get the black gear out you just need to get your flat head screwdriver underneath it just like this and pop it out and check out the difference! So the black gear is completely busted as teeth missing, this piece of plastic is cracked so we are going to replace it with our new white gear. This one you want to make sure you fish all the old pieces of gear out of here so that it doesn’t jam up the new gear. Look at how soft this piece of plastic is it is just coming apart in my hands. Once we are sure all the old pieces are out here, we can grab our new white gear and that is just going to slip right in. Kind of clips right there, good and you can see that measures with the red gear and that’s good. Now we want to remove our old warm gear. So just get a flat head screwdriver, should help pry that off and should help pull off the rest here. So we get our new warm gear and that is going to slide right on. With this, you want to push the warm gear almost towards the base, but you don’t want to touch the base. You want to give it some space, a little bit more, good, so you can see how there is a gap right here so that this way, the gear won’t bind. Now we can just push this in here, give it a little turn as it goes in, turn the motor. Alright, with our new gear in there and everything in place, let’s put this right in place. So will start with our speedometer and tachometer and all these gauges they just pushed right in, they have the prongs that fit in here. So just put it in place and push it right down until it clicks. Same with the left side and the right side, now when everything is put in its place, we don’t want to forget to put one of the screws right there because once you put the plastic cover, you can’t get to the screw. Now you guys saw we did this whole job with a screwdriver. But to make things go a little bit faster, I’m going to use an electric screw gun. With that screw screwed in, now we can get the plastic cover. Now did not only dust that plastic cover with air before but also took a microfiber cloth and gently cleaned the surface here. You have to be careful, its soft plastic so easily scratches, so don’t use a paper towel, make sure you use warm water and I made this thing look brand sparkling new check that out. That is going to look really nice once in the car. That sits right on top. Now there are around 8 screws that go around the edge of the black plastic, I’m going to screw those in. Always snug these up and don’t over tighten them because we are only screwing into plastic. Now we are almost done, let’s flip it over and change out the bobs. The 5 black knobs are the large bobs that provide the backlighting to the cluster. The bases knobs are the dummy lights like the wacullian or black oil or the ABS light. We are only changing the larger light to LEDs. So all you need to do is twist the knob and the bob pops right out. Now with all our bobs right out, let’s replace it with nice new LED bobs. The LED bob is similar in size to the stacked bob so should fit. All you do is pop out the old bob and fix a new bob. One thing you want to be mindful of when using the LED bobs is that in many cases polarity matters. When you have it plugged it in and you turn it on, it turns on in this direction and when you unplug it and just flip it around and plug it in, it might not turn on. In this case, it does go on and so polarity doesn’t matter. But in many LED bobs polarity does matter. So if you plug it in make sure they all light up. If it doesn’t light up, take it out, flip it around and plug it back in. With our old bobs removed and our new LED bobs in, let’s install it into our dashboard. The new bob is pushed in, turn it on and make sure you have the clearance, good turn it till it clicks in the right place. Make sure you do the same exact to the other four bobs. Alright, we are ready to install this and see if the odometer works and see how the LED looks. So let’s go and install it in the car. Installation is the opposite of removal. Connect the two electrical pick tales into the gauged. Slide the gauges and screw in each of the 4 screws so there is a snap. A drill makes up the juggle of work go faster. The black plastic bezel slides into place and any other pushes so that it clicks in. now we have two more screws holding in the bezel, good and now one last thing our headlight knob. You just push that in until it clicks just like that. Alright, we have our new bobs and more importantly, we have our new gears which replace the old broken ones. Now we just need the plug in the battery and let’s go out for a rude. I went for a little cruise around town and it looks like we fixed the odometer, check out the time lapse both the odometer and the triple odometer are working and little by little the jeep-string is getting fixed up. How to fix an Odometer that doesn’t spin. Read More: How To Change Your Car Oil? In this review, I will include the best Launch Scan Tools for either beginners, DIY, or professionals. So, sit back and let’s narrow down your choices to the best Launch scan tool that suits you best. Built with a 1.4GHz A9 quad-core processor, the Autel Maxisys MS908 runs on the Android operating system (OS). That’s why it has an amazing speed. This review is a close look at the BlueDriver, one of the best Bluetooth Professional OBDII Scan Tools for iPhone and Android Devices in 2019. In this post, we’re taking about the Diesel Particulate Filter (DPF) and all You Need to Know about it. Check it out now for more details.